Photovoltaic panels pointed at the sun to absorb solar energy. Photovoltaic panels are assemblies of photovoltaic cells, or solar cells, which convert energy from sunlight into electricity. Because solar cells must be protected from the environment, the panels are often contained by a metal or plastic frame, and may have a glass covering. When many solar panels are used together, the configuration is known as a photovoltaic array or a photovoltaic system. Modern photovoltaic panels use thin-film cells, which are both more compact and lower cost than previous designs. There are two major types of technology that may be used in solar panels, rigid thin-film and flexible thin-film. In rigid systems, all the solar cells in a panel are created directly onto a sheet of glass, which is laminated with another sheet of glass. In flexible systems, the cells are created on a flexible substrate, such as an insulating polymer film, or a conductive material. 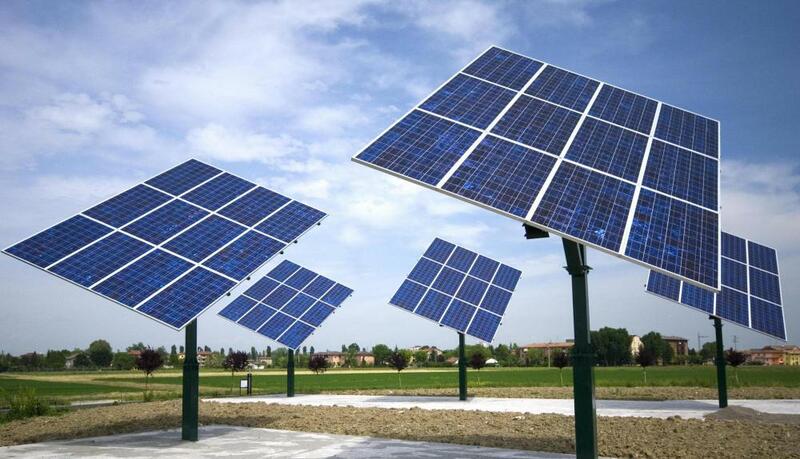 The solar cells in photovoltaic panels are electrically interconnected, either serially for optimal voltage, or in parallel for optimal current source capability. Solar panels may include solar cells designed to convert light energy from a range of different light frequencies into electricity for maximum efficiency. The use of infrared solar cells can also increase efficiency, allowing the panel to function at night as well as during the day. Photovoltaic panels may also make use of small mirrors or lenses to concentrate and direct light onto the solar cells. Solar cells must be protected from the elements in order to continue working. They can be damaged by heat, cold, moisture, hail, wind, and snow. They must be transported properly, as well as stored properly in the panels, in order to function for a reasonable length of time. Some solar panels include diodes to prevent overheating. Many manufacturers of photovoltaic panels guarantee performance at 90% of rated power output for 10 years, and 80% of rated power output for 25 years. Using photovoltaic panels as an energy source creates no pollution and makes use of a virtually limitless resource, sunlight. It is also much cheaper to run than other power technologies. However, the initial setup of a photovoltaic system is very expensive, and a solar power plant would require a huge amount of land. Also, solar energy is not very efficient based on current technologies, though there is much research dedicated towards improving the functionality of photovoltaic panels. One significant problem is that solar cells produce direct current (DC) energy, which must be converted to alternate current (AC) energy in order to work in most modern electrical systems. What Is a Photovoltaic Array? What Are Thin Film Photovoltaics? What is the Photovoltaic Effect?